In a bowl of food processor pulse together pitted dates, oats, maple syrup, and nuts until a sticky dough forms. Press the mixture into bottom of a tart pan(s) in a flat layer, working up sides to form the crust. Spoon the Greek yogurt onto the top of the crust and spread evenly with the back of a spoon. 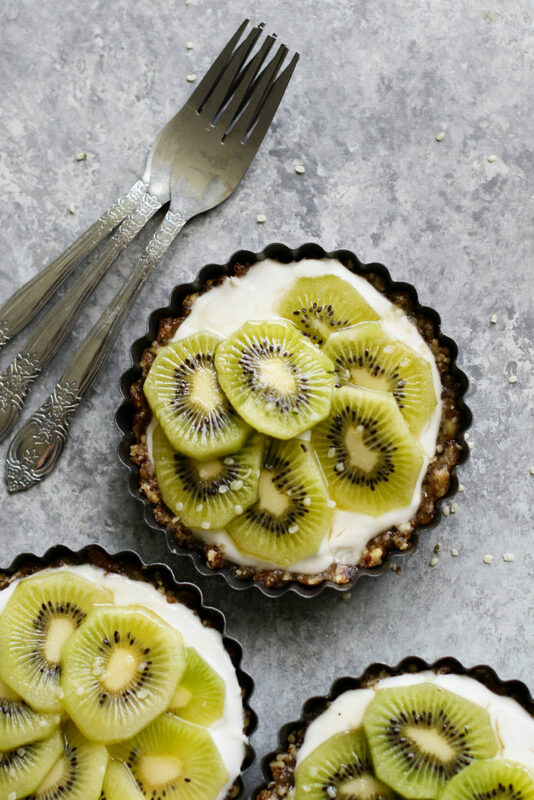 Add the sliced kiwi to top of the tart in a circular fashion. Chill fruit tart pan(s) in the fridge until ready to serve. To remove the tart(s) gently pop the bottom out and transfer to a plate. Serve chilled with a drizzle of maple syrup and a sprinkle of hemp hearts.